Two pick truck drivers in Canada were caught on camera coming to the aid of a cyclist who was being followed by a grizzly bear. Robbie Flemming was driving from Calgary toward Radium on July 14 when he saw a cyclist with full touring gear riding slowly up a long climb. He told Global News: “All of a sudden, I see a young grizzly jump over the Banff-bound guardrail in front of a tour bus and go loping across the highway. He began hitting his horn to get the cyclist’s attention, seeing that his speed would not outrun the bear. He pulled his truck in between the rider and the bear, and turned his hazard lights on. A second pickup-truck driver saw what was happening and also pulled in between the space between the bear and the cyclist. Once the cyclist was out of the bear’s line of sight, the rider gave a thumbs up to the drivers and rode on. In 2013, we reported how Brad Paras posted footage to YouTube that showed him and his cousin being charged three times while out on their bikes in Alberta, Canada by a female grizzly bear protecting her cub, with both riders escaping unscathed. Neil Davidson at Banff Sheriff Court. A lorry driver could now lose his job after being banned from the roads. Neil Davidson had been driving loads of grain from a farm near Aberchirder to a storage depot when he misjudged a turn on a country road and toppled his vehicle. And Banff Sheriff Court heard yesterday that it skidded across the road before colliding with an oncoming car at about 5.30pm on September 22 last year. The lorry spilled its load across a field and damaged fencing worth about £1,500. Davidson admitted driving the lorry carelessly and at excessive speed, causing it to tip over and collide with the car. No one was seriously injured in the incident, but Davidson, who has previous convictions for dangerous driving and driving recklessly, had to be taken to Aberdeen Royal Infirmary for treatment to bumps and scrapes. 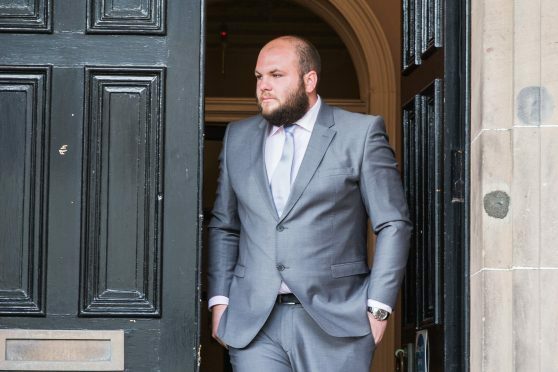 Sheriff Philip Mann banned Davidson from the roads for nine months and fined him £450. Defence agent Debbie Wilson suggested that the 27-year-old, of Windy Brae, Banff would struggle to pay for his home if he could not continue to drive. She told the court: “This was his fourth run on this particular route this day and he had a fifth one to do. “He was not a greatly experienced lorry driver. “Mr Davidson was going too fast, or maybe got to cocky about the route. 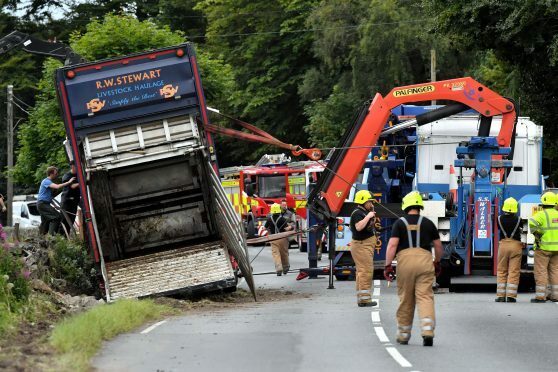 Fiscal David Thorburn had told the court that the driver of the car Davidson collided with had stopped his own vehicle because he believed the lorry to be going too fast for the route – the B9025 Aberchirder to Turriff road. Sheriff Mann said: “The only appropriate way to deal with this is to impose a period of disqualification. BANFF, Alta. — It’s been settled – autonomous trucks will not be on our roadways anytime in the next decade. That, at least, was the general consensus of a group of panelists examining the future of autonomous and platooning in the industry during the Alberta Motor Transport Association’s (AMTA) Leadership Conference April 29 in Banff, Alta. Laskowski said OEMs and governments are instead concentrating on the types of technologies being created in an effort to achieve a truly autonomous vehicle, and those advancements are being used today to make drivers’ jobs safer and easier. But as for seeing autonomous trucks on North American roads, other than in Alberta’s oilfields or a yard somewhere, Laskowski says not to hold your breath. “Nobody in the public or a politician is going to let an 80,000-lb vehicle down that road with nobody in it right now or for the foreseeable future,” he said. Cindy Clark, dealer principal for Sterling Western Star Trucks Alberta, agreed, and said the current push for autonomous technology comes from a desire by each OEM to be first across the finish line. “When you have five players with more money and they have investors, you’re going to try and be the first guy in,” Clark said, adding that the onslaught of new technologies is not because they are being pushed, but rather more readily available to the public, particularly when it comes to cost. But cost is not on the side of autonomous trucks, Clark said, despite the fact that the technology is there. Clark said Daimler, one of the trucking industry’s biggest players, has relayed that it would not be rolling autonomous vehicles out of its factories in the next 10 years because of the costs associated with such an effort. Clark believes in order to gain society’s confidence in autonomous technology, there is a need for additional small test tracks, like the one located at the University of Alberta, where trials could take place. Laury Schmidt, district sales manager for Volvo Trucks of Canada, said customers are driving the push toward autonomous because of one “killer” word – downtime. Schmidt questioned the social acceptance of driverless vehicles, particularly trucks, comparing the idea to a commercial airplane with no pilot. He said there are multiple ways the industry could reach the point of an autonomous truck reality, such as economic demands, driver shortages, technology advancements, and customer demands. Wendy Doyle, executive director for Alberta Transportation’s office of traffic safety, said government must play a balancing act when it comes to not stifling autonomous technology innovation, and admitted that government doesn’t really know what to prepare for. She said autonomous vehicles will have a huge impact on several government policies, such as driver training, where rules must be in place to continue testing drivers for the necessary skills needed to operate a vehicle on the road. Doyle said in any given year, collisions in Alberta cost between $5-$11 billion, and technology can help minimize that. Despite tentativeness when it comes to autonomous vehicles, Schmidt believes platooning technology is strong and right around the corner. Dan Duckering, president of Duckering’s Transport, agreed, but said it wouldn’t be an easy process. In order to invest in platooning or autonomous truck technology, Duckering would need to see the return on investment, and where costs would be saved, such as fuel economy and no need for a driver, because the investment would come with a hefty initial price tag. This is, however, the age of ever-changing technology, Duckering said, and carriers of the future will be the ones that embrace these new technologies. Another challenge Laskowski pointed out on the drive toward autonomous is the fact that Canadian companies purchase their trucks from US OEMs, and there is potential for the Canadian government to impose different regulations than are in place south of the border. But Laskowski emphasized that what the autonomous craze is trying to accomplish in 2017 was not a driverless truck. Laskowski feels this effort is vital since a new crop of young, inexperienced drivers will soon have to replace experienced drivers who are looking to retire. “How can we make our trucks safer knowing that we are going to have to put less experienced people inside the cabs?” he questioned. Doyle said government legislation of autonomous and platooning vehicles would be a mixture of revamping what is currently in the books and creating new rules of the road, as right now in Alberta, a vehicle cannot travel on a roadway without a human inside. But before that point arrives, innovation must continue and society must be shown it works. “Create the framework to allow the OEMs to thrive and the carriers to be creative by their own accord,” said Laskowski. BANFF, Alta. – Stephen Laskowski says the Canadian Trucking Alliance (CTA) can only be as successful as its members will allow it to be. Laskowski provided some insight into the state of the industry, highlighting how he intends to continue the work of outgoing CTA president David Bradley, including what he feels should be the top priority for the association and trucking companies moving forward into the future – adaptability. Laskowski said despite the arrival of new product delivery modes, such as drones, freight will always get to its destination by truck, but new technology was certainly a wake-up call to the industry on how products can get delivered in the future. The North American Free Trade Agreement (NAFTA) is another area Laskowski will focus on as CTA president. Laskowski said carbon pricing, which the Province of Alberta introduced Jan. 1, should be implemented in as simple a way as possible if provinces choose to explore the tax, pointing to the fuel surcharge system as a possible tool to be used. As for government regulations in general, Laskowski said it’s not about the need for another rule, but rather what opportunity the rule could present to the industry, underscoring the upcoming electronic logging device (ELD) mandate as an example. Laskowski said Bradley had been relaying the importance of a Canadian ELD mandate to government for some time, and now with the US taking the plunge, Canada has fallen behind, with full enforcement of a Canadian law in his opinion not coming until late 2019 to 2020. Bradley said the Canadian trucking industry was doing well compared to its southern neighbors, pointing to the plethora of safety awards bestowed on Canadian carriers each and every year, and that with the time it takes to get mandates approved and become law, the government is often playing catch-up with the industry. Laskowski feels in order to overcome the driver shortage, the industry must shoulder the issue itself and try to attract professional drivers, not seat holders. This effort begins with changing the government’s National Occupation Classification to include driving, Laskowski said, and the implementation of the mandatory entry-level training (MELT) program is a step in the right direction. The possible legalization of marijuana in Canada is another issue the CTA could be forced to deal with in the coming years. Laskowski said the CTA is against legalizing marijuana until reliable testing is available to identify those who are impaired, and until that time, carriers should take a zero-tolerance approach.